The pellicle, calmly laying atop 4.5gallons of homebrewed lambic. Brewed with candi sugar and inspired by Drie Fonteinen Straffe Winter. The oak resides on the bottom reminiscent of fish tanks but I couldn’t get the shot right so I settled on a more downward view. It seems like just yesterday, four people and myself piled into an Outback wagon, and proceeded to bbq for warmth in the parking lot of my favorite NY brewery. Captain Lawrence. Rosso E. Marron falls into their A list of sours, with neighbors like Cuvee De Castleton and Flaming Fury. I’ve had Castleton batch #1 and it was one of the most delicious things I’ve come across ever. Alcohol or no. So I have confidence that the aging potential is most definitely there. Sadly, I missed the recent Rosso batch#3 release due to financial circumstances. But fortunately, John and Jen of FoodandFermentation did make it. Check their blog for coverage. But we pooled our cellars together and made a little vertical to see Rosso through the ages. In typical fashion we went youngest to oldest. At 10% abv, this flanders red/oude bruin (I’ve seen it classified as both, but I feel it’s edging more towards flanders red), is no pushover. Batch #3 poured rich and hazy. A dark marmalade with a quickly vanishing head. The aroma has a slight vinegar char, loads of rich red wine notes, the barrel influence is clear and present. The taste has powerful hits of luscious citrus and cherry notes. Lively carbonation, cranberries are heavy on the finish. I can’t tell if it’s just barely there, or if the mushroom earthy flavor I got from batch#2 fresh is not making a showing at all. It could be my imagination. Batch #2 also had a rather hazy pour, which was conflicting with the bottle I opened a few months back which was eerily clear. The first pour was clear-ish, but the subsequent pours were all hazed. No worrries though. The nose was filled with that wonderful chanterelle mushroom quality I adore about this beer. Bracing acidity, but the alcohol is nearly gone from the nose. The taste is more acidic than #3. It starts off with a gentle roll, but kind of landslides into a bit of a mess. I’m chalking this one up to bottle variation due to the magnificence of the bottle of the same batch I drank months prior. This is still quite tasty, just a bit rough, and much more like a fresh Rosso than an aged one. The star of the show however, was batch #1. Superior appearance, superior aroma, superior taste, and definitely the most complex. Amazing shades of maroon and copper blend. Nice carbonation still, a dainty white crown. I see why they waxed this batch, the caps did not seal well and the entire lip of the bottle was slightly rusted. The nose was loaded with the mushroom earthiness. Heaps of brett over a subdued fruity background. Good god it’s good. The alcohol is still noted, but just faintly. It’s not intrusive, but plays really well with the rest of the aroma, giving almost some sherry qualities. This one tastes epic. Easily head and shoulders above the rest of the pack for me personally and the group agrees. Crisp wonderful citrus and tart melon flavors blend into the trademark brett dry induced dry finish. My favorite, the mushrooms, blast at the tail end but then clean up instantly from the tart fruits. Grapefruit flavors weave in and out, creating a wonderfully diverse fruit profile. This is the second time you’ve done this to me Captain Lawrence. You did it with Cuvee De Castleton and now Rosso. How do you get such an amazing flavor profile?!? I’m always left stunned, and always smiling like an idiot after my first sip till the last and then some. From this tasting, I’ve decided that Rosso may take a turn for the worse before it gets better. I may have just missed that window a few months ago, or it could be bottle variation. But others have mentioned that at one year, Rosso batch #1 was downhill. 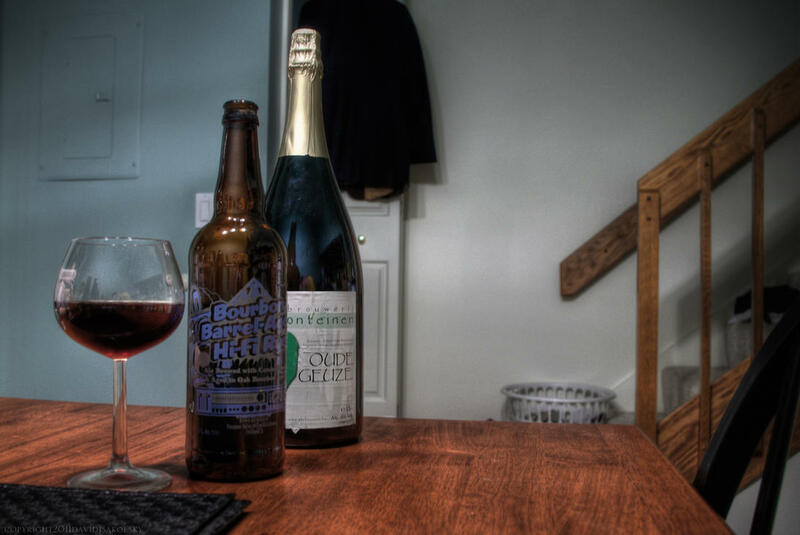 And now we have this…again, could be bottle variation or it could be just the process of aging. Captain Lawrence‘s sours are hard to turn down and great fresh, but man do they age miraculously well in my opinion. Let’s preface this proper. I love rich english barleywines. I find most of their American counterparts to lack a soul in comparison. I love rye. I love barrel aging. Fast forward to a few nights back and this little gem was brought out to the tasting table. Flossmoor Station’s Hi-Fi Rye, an 11% barleywine comprised of over 50% rye! If you’ve ever homebrewed with half that much rye, you can understand what a task that actually is. This particular version spent some time napping in bourbon barrels. A quick pour reveals a deep crimson with little foam action. One should be expecting this given the nature of the brew and the barrel time. I’d love to wax poetic but the appearance on this one was a bit simple. Although it was quite sophisticated and subtle. Running the gamut of deep reds and burgandies. It just didn’t jump out at me. The nose is stunning. Deep dark fruits, figs, toffee, caramel, usual fare for a nice barleywine but the mass of rye really brings this nose together in a nice little spicy package. Easily my favorite part of the brew. The taste is a little lackluster. Perhaps that’s the wrong word. It’s not detrimentally light in flavor, it makes it oh so easy to drink this 11% abv monster. Loads of spicy rye, slathered in a nice buttery caramel dimension. Thick rich mouthfeel. One of the better barleywines I’ve had in a while. Although as of recently, Norrebro and Shaun Hill have spoiled me as I finally got around to a bottle of Little Korkney Neipoort barrel aged barleywine. I’ll have a review of the cognac barrel and base versions soon. We are back! And I could not be happier. It’s been too long and I really miss being able to express myself through the blog. I’m one of those weird kids who goes a little nuts if I can’t be creative. An extremely long story short, I’m single now, with a new job on the ground floor of a very promising agency. Startup work is costly on time and thrifty on payment, so it’s been a little longer of a transition than I would have liked, but it’s moving along now and I have high hopes. 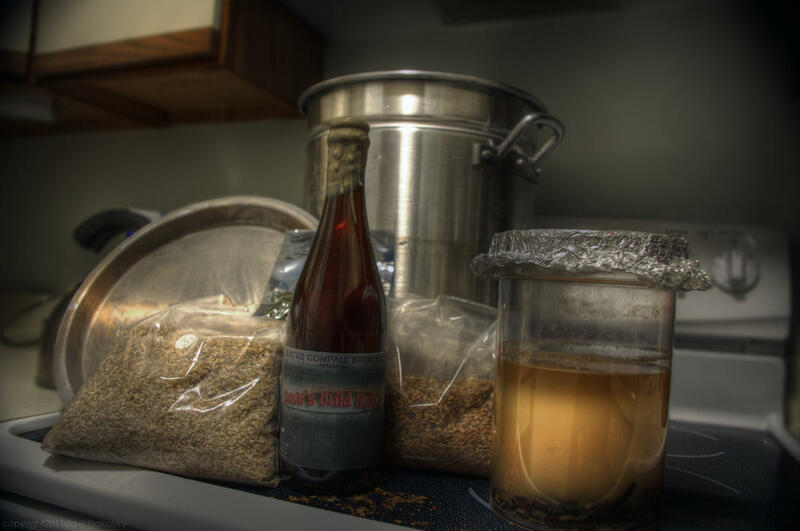 Back to beer though…I have been on a slightly insane homebrewing bender lately. So while my homebrewing will slowly become more and more a part of this blog, the commercial stuff will always have it’s place. It’s finally coming to fruition. My first sour home brew and I am quite pleased. Had to take this shot for posterity and all. More reviews and more frequent updates soon! *For those asking, the container on the right is a stepped wild starter consisting mostly of oak chips, cubes, and acetobacter made from the dregs of Wild Rye’d. It’s been recently agitated, hence the milkshake like color. Quite the treat tonight. With roughly four hundred bottles of the re-release at Ølbutikken this past year in Denmark, this is the 2003 vintage Drie Fonteinen Malvasia Rosso. Otherwise known as Druiven Gueuze. Also to be noted, it rings in at a hefty 8%abv. Not everyday you see an 8% gueuze of this caliber. 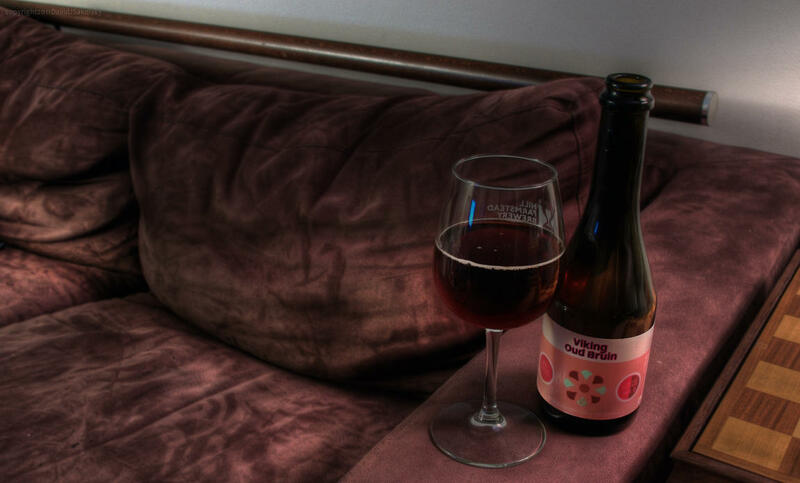 A gueuze blended with Tuscan Red grapes and to add to the rarity, is one of the few that was brewed entirely by Armand himself at Drie Fonteinen. 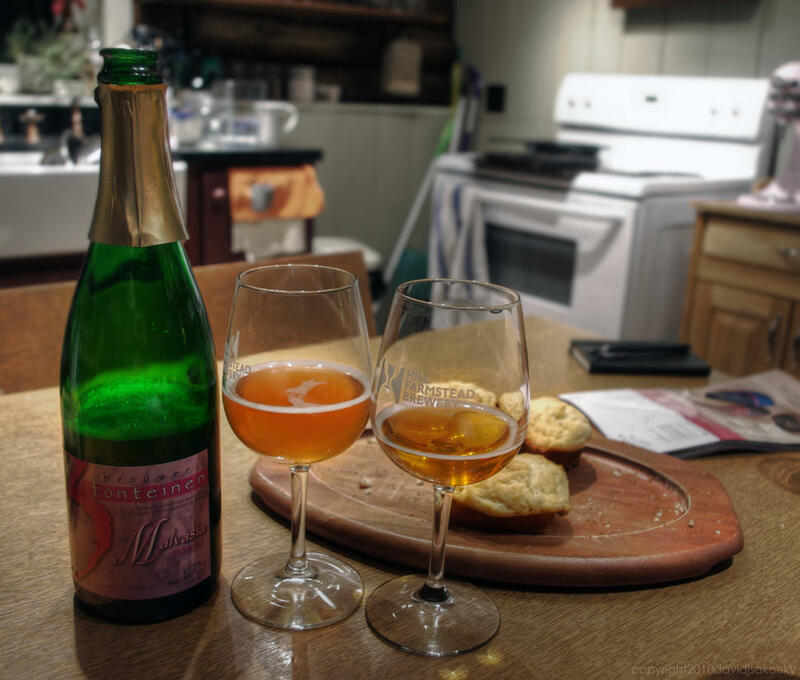 For those unsure of the terminology, gueuze is traditionally a blend of one, two, and three year old (oude) lambic. With some young (jonge) lambic blended in to make a nice spritzy, funky, delicacy. This one had been sitting for a couple weeks. After unwrapping the cage however, John felt the need to crack some jokes about explosions (we had opened a hell of a gushing Abbey St. Bon Chien Grand Cru just prior) and in a gunshot second, the cork was at the ceiling and glasses were scrambled for. Hence the two very different pours we have in the photo. One crystal clear and of beautiful shine and highlight. One a bit murkier, with an oddly captivating mimosa type coloring. Very lively and bubbly. A light, extremely white foam crown sits atop the apple cider like shades of yellows and coppers. The nose reveals a very solid brettanomyces funky bitterness. Followed by a light honeysuckle and tea flavoring. Very light and airy, loads of brett though. Could be on the way downhill, I’d advise to drink sooner than later. Says the kid with a bottle I’ll be holding onto for at least another five years. The taste is extremely refreshing. Lively grapes smash into the back of the tongue and throat. A huge presence of apples and apricots, some tangerine comes into play. You know that flavor that a peeled red grape has? I get that. In abundance. Adds a nice nostalgia to this brew that makes me really fawn over it. Excruciatingly nice, very light and rounded with amazing sweet citrus flavors. Warning: I am a novice homebrewer. Partial mash at this point and time. Late last august I brewed up two beers during the worst heat wave New England has seen in quite some time. 100+ degrees for a couple weeks there. I have no temperature control for fermentation. One was a Roasty Rye brew, sort of an everything I have leftover omelet of a beer. Starting at an og of 1.089 and never going past 1.032, I bottled half and didn’t even bother bottling the other half. The bottles are still crappy to this day. The other was a tripel I had high hopes for at 1.100 og. Even though this didn’t ferment past 1.040, I was stubborn and put a gallon on reisling wine soaked french oak chips and bottled the rest. The bottles are still crappy to this day. The tripel was aging in a one gallon jug with the wine soaked oak and the Rye 2.5 gallons were sitting in the fermenter uncovered. I left for vacation in VA beach with a couple cases of my last successful homebrew so I was happy. I came back a week later to see the Rye had started to form a small pellicle. I was rather excited as I love sour, acidic brews. Although I didn’t know quite what to think. We are now around late September and I just started throwing in dregs of whatever I had been drinking. 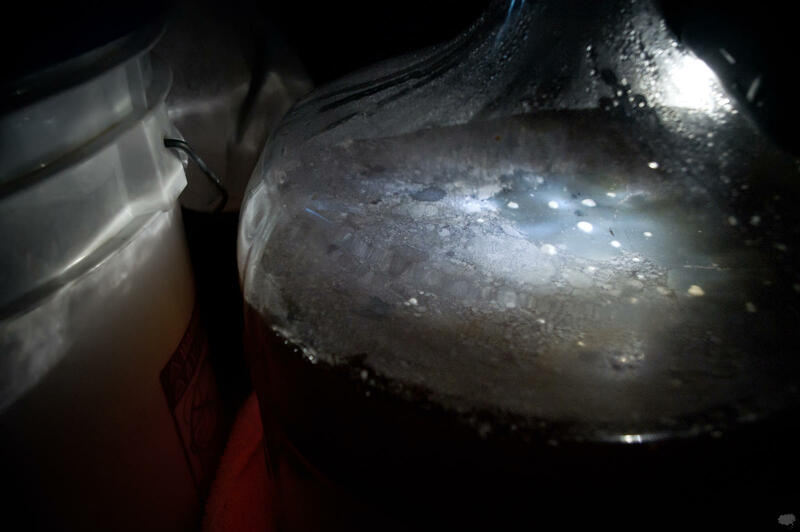 A couple weeks later a HEAVY cheesy pellicle had formed so I said screw it and tossed in the gallon of tripel and reisling oak chips and promptly left her alone for about four months. HOLY CRAP! Two wrongs DO make a right! My two failed beers had turned into something wonderful. Amazingly acidic, like corked la folie, flaming fury, or even duck duck, 007, or cuvee de tomme. Loads of granny smith and cranberries, a little ethanol and pretty damn nice clarity too! This needed to be bottled asap. My plans to cork and cage fell through, but I capped off just under 3.5 gallons into 22 12oz and 4 750mls. Four 12′s and one 750ml were bottled still and the rest were primed. Even still I think it’s worthy of a price tag and in vein with some very heavy hitting sour ales. Extremely excited to try this carbonated, I even brewed again today and used the funky cake and bug ridden oak chips on a new brew. I can’t believe how fast this actually soured. It was sitting in an ale pail with lots of headspace, maybe that helped. I also had a rather large fruit fly larva problem for a little while, but after some reading on babblebelt I cleaned them all up about a month before bottling (which was the only time I had checked it). So here’s to you homebrewers who just won’t fail! 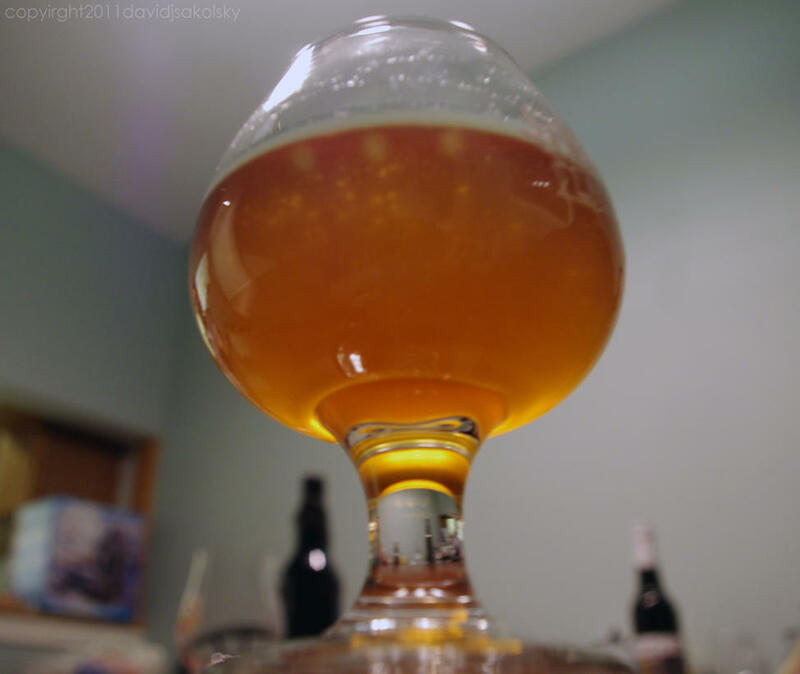 Not much makes a homebrewing sour head like me happier than having a load of sours to drink! A sort of Flander’s Ale I suppose. 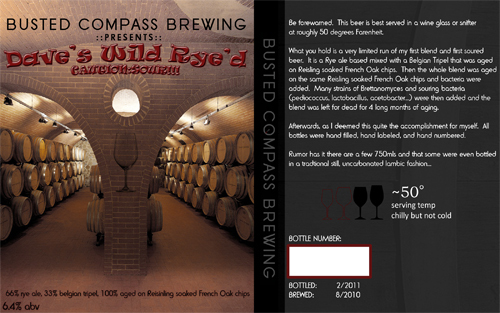 66% Rye Ale Base, 33% belgian tripel, 100% aged on Reisling soaked French Oak Chips and multiple strains of bacteria. Three Floyd’s Hell’s Black Intelligencer…Not yet bottled, but after tasting it I can honestly say it would be a travesty if this never sees distribution. The best coffee brew I have ever had, bar none. Classified as an oatmeal stout and ringing in at 6% this beer is all too easy to drink a lot of. This brew is made with Intelligentsia coffee, which I have yet to have on it’s own, but after tasting this beer I must seek it out. 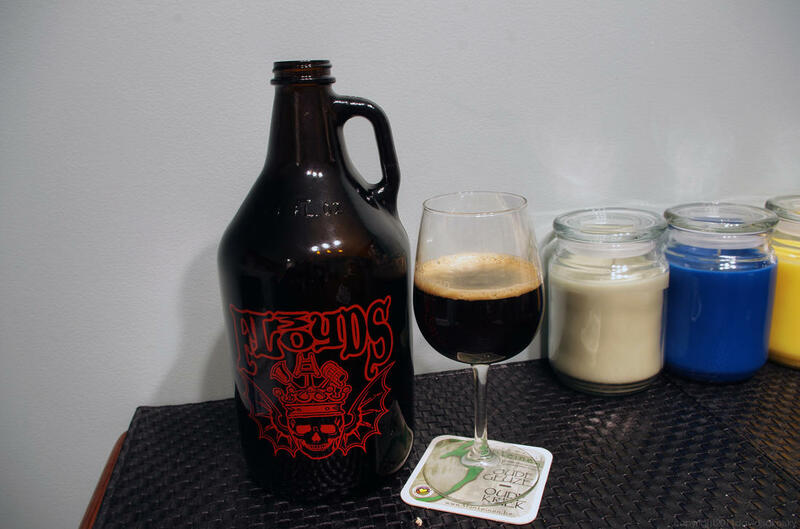 The appearance is a typical heavy stout black with a wonderfully frothy cappuccino like head. Not a whole lot alludes to the craft that lies within. The nose is all intense roasty, rich coffee. Very espresso like, I may be in love. Some mild chocolate interplays with the roasty goodness. Fairly straight forward but very nice. The taste is off the charts. I cannot talk enough about how amazingly good this is. It’s not complex, but it’s just wonderful. It hits the tongue exactly like chilled espresso. Frothy, roasty, thick bodied. Perfection for a coffee oatmeal stout. A crisp chill on the backend cleans up nicely, an epic example. So this is my plea Three Floyd’s. Please. For the sake of showing people what coffee brews can aspire to. Please bottle Hell’s Black Intelligencer. 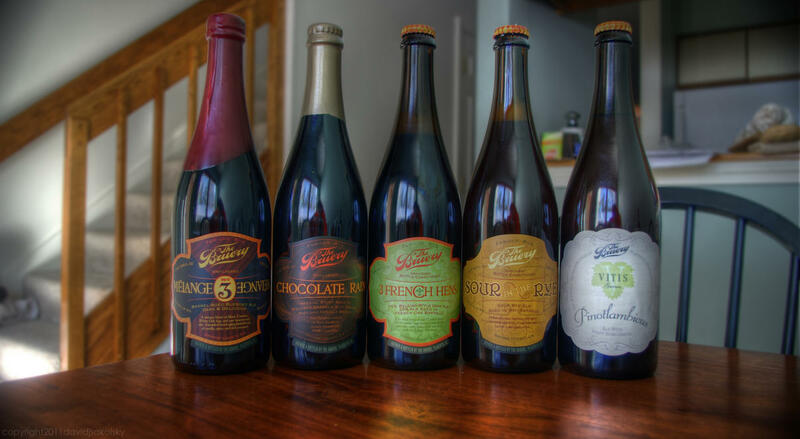 Had a couple nice boxes from The Bruery land recently thanks to the Reserve Society. Melange #3, a blend of Black Tuesday, White Oak Sap, and Papier to the tune of 15.5%abv. Chocolate Rain, Black Tuesday cask aged on vanilla beans and cocoa nibs. 18.5%abv. This was this years Reserve Society mystery release. Formerly draught only no growlers. 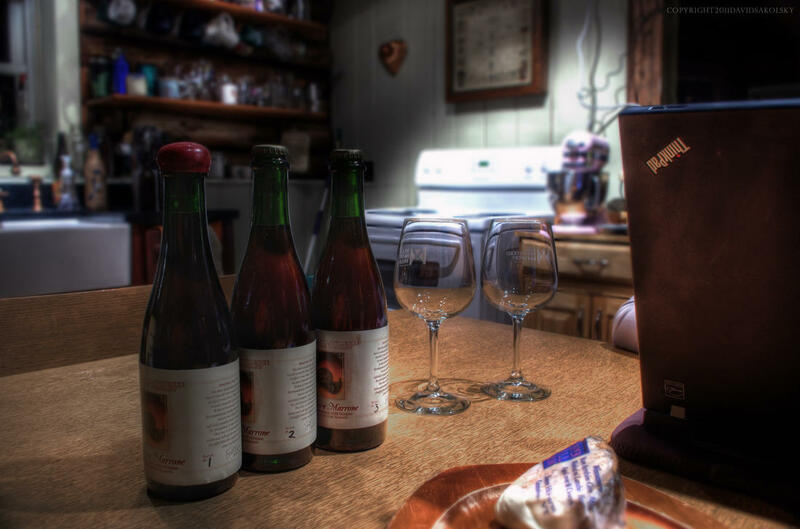 3 French Hens is the 2010 contribution to the 12 Days of Christmas Vertical, a belgian strong dark ale. 10%abv, while it was an RS beer it was distro’d nationally I believe. Sour in the Rye was also part of the Reserve Society. Really looking forward to it as I love rye and sour beers. 8.7%abv and also formerly draught only, no growlers. Vitis Series: Pinotlambicus was part of this past years Reserve Society but made it to the shelves in California. An ale made with pinot noir grape juice and then cask aged for a bit. The Pinotlambicus will most likely get reviewed first.